At this time a week ago, I was returning to my room at Sun Mountain Lodge, near Winthrop, Washington. 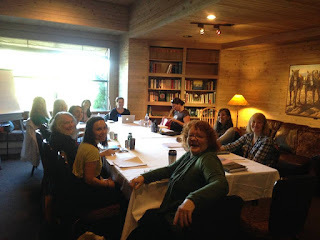 I had just completed the first full day of the Methow (pronouned MEH-TAU, I learned) Valley manuscript conference put on by Writing by Writers. The day before had been a full day, comprised of 8 hours of driving with another writer along for conversation, checking into our rooms, conference registration, dinner, a mandatory welcome meeting, and then an hour in our specific author cohorts. But the first day of workshop and panel and meals with the evening activity was last Thursday. It was a powerful experience. I met some wonderful writers and reconnected with a couple of others from other workshops. I received helpful feedback on my ~15 pages and shared feedback (in the new Lidia-style-critique). I heard great writing. Went on walks and a short hike. Took turns on different patios and decks. overlooking the Cascade Range or the pool or a meadow. Drank in the bar. Attended a wine tasting. And more. I left feeling energized about my writing. Confident about my writing. I had a better direction to go and left knowing my writing is solid and I can do this and I will do this. Even after a few days of working long hours, I am still working on my writing. Even after diving into the script and the production of the next show I'm interpreting I am still carrying around the feedback and advice and insights about my writing. I also kept my Tuesday writing time, which I used to edit a piece for submission and that also doubled as my submission for my critique group. As I typed the above paragraph, I realized that what I submitted to the critique group is double the length we agreed to share for feedback. I just sent the group an email and asked them to ignore half of it. See? Enthusiasm at writing! Writing by Writers, led by the incredible Pam Houston, was a wonderful writing conference. Worth the time and the money. And I would do it again. They have other writing conferences - generative and manuscript and combination - at other locations. They will be returning to Methow Valley next year and I may return, as well. With a completed final draft of the manuscript, I hope. I have set a goal for myself for a revised draft completion. I have also identified some blocks of time where I can focus on the manuscript, because part of the work I'm doing will be easier if I have time to focus in and not be distracted by work, and especially not by theater. It was a great five days in Methow Valley. I'm working hard to keep the writing flow going, even though the word river has to pass through and over and around some reeds and boulders in the stream. But nothing is going to stop me now. And I have my Corporeal Writing underwear for the days when I feel doubt trying to take over.